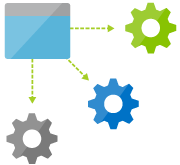 Use Azure Queue Storage to create flexible apps and partitioned features to achieve even better durability between large workloads. When designing scalable apps, they can be separated into program modules and each module can scale independently. In communicating between modules, Queue Storage can queue messages asynchronously whether they are in the cloud or local and running on desktop or mobile equipment. Queue Storage can increase app scalability and lower sensitivity to individual module malfunctions. If a part of the infrastructure appears to malfunction, the message will be buffered and workload integrity maintained at other processing nodes. Queue Storage right sizes service deployments. When applications experience unexpected traffic surges, it prevents servers being attacked by receiving sudden sharp increases in requests. It monitors queue length, adding flexibility to apps, and deploys or halts assistance from additional nodes based on customer requirements.